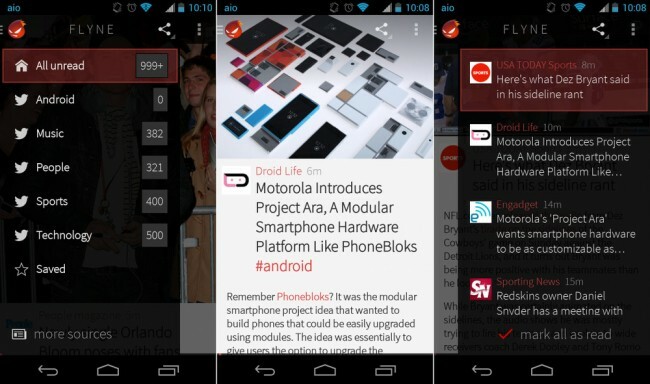 If you are into Android and Twitter, then you have more than likely heard of Falcon Pro. The app was without a doubt my favorite Twitter app, as it featured a double swiping navigation, beautiful UI, and about as many features as you’ll ever see packed into any app. Unfortunately, it’s time came to a close far too early since Twitter decided long ago that it wasn’t the biggest fan of third party apps stealing its thunder. Falcon Pro’s fate was sealed before it ever launched, which is really too bad. So what has the developer of the one of the most talked about apps of the last year been up to? Making more apps of course. Joaquim Verges introduced his newest app last night, called Flyne. It’s a reader, more or less, but it uses Twitter to come up with stories in specially selected categories for you to read. Rather than asking for your login credentials and running into Twitter’s cap on tokens, Flyne doesn’t need anything from you other than a few selections of news categories you’d like it to present. You’ll find everything from Android to Music to Food to World news as options. 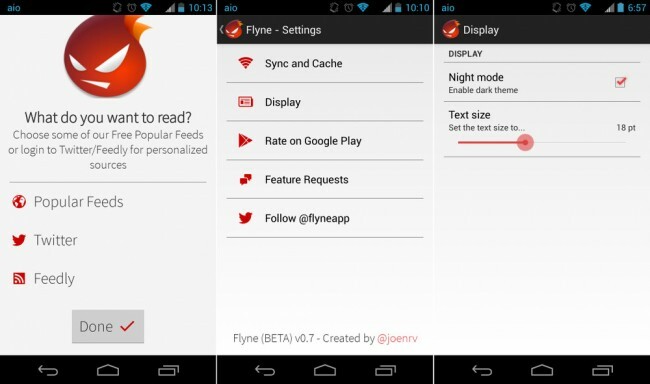 Once selected, Flyne actually pulls from popular Twitter accounts in those selected categories, and then presents you with magazine-style full-feed articles. For example, in the top image you can see that the app pulled in an article from a Droid Life Tweet, but then features the entire article underneath, instead of forcing you to go to the site. Navigating around Flyne is quite similar to Falcon Pro. A swipe from the left gets you into a navigation menu that lists out your categories and how many unread items you have. A swipe from the right gets you a list of articles from a selected category that you can scroll through. You can mark all as read or jump into a particular story from there. Once on an article, you can swipe left or right to get to the next article, tap on links to enter the browser, save favorites for later, or share with friends. If you want to take your experience to the next level, the app has two different in-app purchases that will unlock Feedly and Twitter account integration. So if the articles Flyne pulls in on a free level aren’t enough to keep you satisfied, you can essentially turn it into the ultimate Twitter/RSS reader with a couple of dollars. The app also has a night/dark mode and a few settings for caching and refreshing.